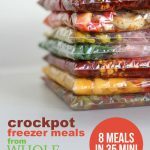 In my last ‘Freezer Ready’ blog post I shared some of my favorite freezer-to-oven and freezer-to-slow cooker recipes that freeze well. I also LOVE to make and freeze CALZONES. I love freezer-to-oven calzones so much that I included TWO calzone recipes in my ’15-Minute Freezer Recipes’ cookbook: Mexican Calzones and Ham & Broccoli Calzones. Freezer-to-oven calzones are awesome because you don’t have to thaw them before cooking them in the oven. Anytime you’re hungry you can simply grab one from the freezer and heat it up. Since the crust cooks in your oven for the first time they don’t taste like leftovers at all. Calzones are also a great meal to take with you on-the-go. I can’t say enough good things about homemade calzones. 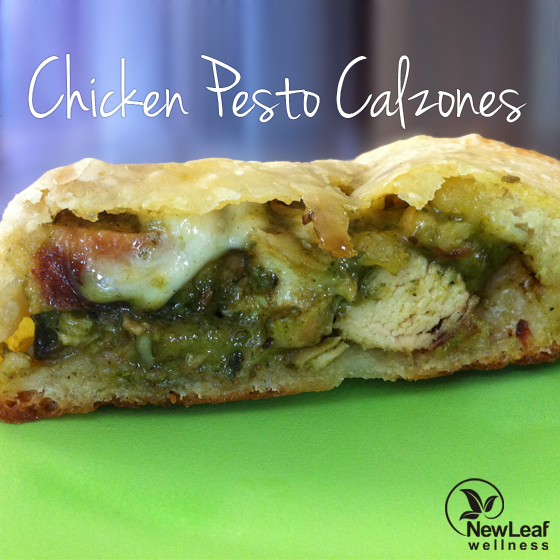 Here’s another calzone recipe that my family loves: Chicken Pesto Calzones. We always make homemade pesto with fresh basil from our CSA farm share and homemade pesto is a delicious addition to calzones. Prepare crust according to directions on package. Spread a thin layer of olive oil onto 2 baking sheets and onto hands to prevent sticking. Separate dough into 4 similar-sized balls, and flatten dough onto baking sheets. Spoon chicken-pesto mixture, cheese, and olives onto one side of a flattened dough ball. Fold the other side of the dough over the top and seal edges with fingers. Repeat to assemble remaining calzones. 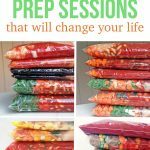 I share my very best freezer meal tips for beginners in my Freezer Meal 101 blog post. If you’re going to freeze some of these calzones, skip step 7 and put the calzones right into the freezer (on the baking sheet). When they’re frozen, remove them from the baking sheet and wrap in wax paper and foil. Then you can store them in the freezer for up to 3 months. Just to clarify – is the cook time and temperature the same after the calzones have been frozen? To cook the frozen calzones, bake at 350 degrees F for 35 minutes. Sorry for not being more clear in the post! I usually make a pepperoni calzone with ricotta, mozzarella, pizza sauce and pepperoni. Do you think that would freeze ok. Wasn’t sure about the ricotta. Yep, ricotta freezes great. I use it in a lot of my frozen calzone recipes. Go for it. Frugal Friday: Filling the Freezer for Post-Baby: Part 1 | Keep on Swimming. . . Delicious recipe! Just a warning for future folks – def go w Betty Crocker and NOT Jiffy pizza dough mix. I was making a double batch and there was only one package of BC so I bought jiffy as my second. The dough was much harder to work with. I’ll totally use Betty Crocker in the future. 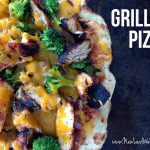 Thanks for your great freezer recipes – I made a bunch leading up to my baby!! Great job, Katie, and thanks for the feedback!